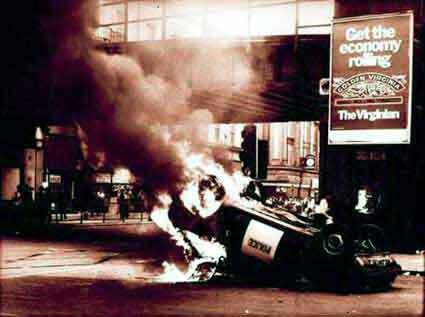 A chronology of anti-hierarchical violence in mainland UK, July 1985 - May 1986. A bit of nostalgia and/or a lesson in over-optimism? A text from that epoch that covers some of the contradictions of the social movements in the period after the miners strike. Includes a look at riots in Liverpool, Notting Hill, Birmingham, Brixton, Peckham, Tottenham, and lots of smaller riots, plus riotous strikes in mining areas, at Wapping and prison riots. Also a look at some of the contradictions of football hooliganism, drug taking and other stuff. Some of it has not come out very clearly, but almost all of it is readable.